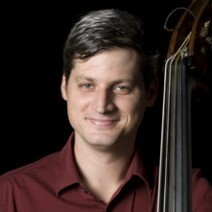 Bassist Reid Taylor has been active on the New York jazz scene for the past ten years. After studying with legendary bassist Butch Warren in Washington D.C. during his formative years, Reid moved to New York and subsequently received a BFA in Music Performance from the New School for Social Research. During this time he studied with Dennis Irwin and played extensively around New York City. He has played in The Flail (jazz quintet based in New York) for the past nine years appearing at Carnegie Hall, Blues Alley, Smalls, Sweet Rhythm, Marseille Jazz Festival, and the Vienne Jazz Festival. Several of his compositions have also been recorded by The Flail and are featured on the past two albums. In addition to The Flail, Reid has performed with Cecil Payne, Grant and Phil Stewart, Sacha Perry, Spike Wilner, George Garzone, and Charles Gayle among others. He appears weekly at the Fat Cat with tenor saxophonist Ned Goold.For more about Reid, visit www.TheFlail.com.